What is it about us in India that we have individual hygiene but collective filth? 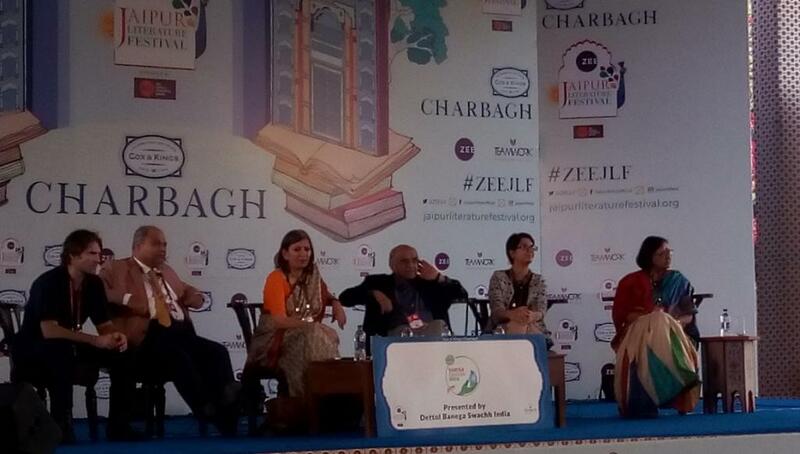 That was the trigger for a discussion on ‘Swachh Bharat: Taking Responsibility for Change’ that took place at the Jaipur Literature Festival on January 26. Gurcharan Das, Indian author, commentator and public intellectual cited Singapore as an example of how it had transformed itself from a third world to a first world city-state. Recollecting his conversation with Lee Kuan Yew, former Prime Minister of Singapore, he said that the city was dirty in the 60s. But then, the government not only launched a cleanliness drive but also created citizens from individuals. “When individuals take ownership of public space they become citizens. But there is a problem when we look at it from the Indian perspective. Civic virtue does not come naturally to us. We think of ourselves first; we don’t think of the public space. That is why an Indian’s horizon of concern should extend beyond his or her door,” said Das. Talking about what he had gathered from his interactions with Prime Minister Narendra Modi on Swachh Bharat Mission, Uday Mahurkar, Senior Editor with India Today said that the first 18 months of the mission were reserved for creating awareness, before the government started implementing it. “The reason why Modi focused on building toilets in schools is the experience he had in Gujarat where dropouts were linked to lack of toilets. Now the challenge ahead of him is cleaning rivers,” Mahurkar posited. However, according to him, municipalities are not working as change agents. “The municipalities in India are a very weak arm of governance. An elected body of a municipality is very weak and corrupt,” he added. Jeffrey Gettleman, South Asia Bureau Chief for the New York Times, who had a long stint in Africa, sees similarities in problems that India and Africa are facing. “Both India and Africa face the problem of rapid urbanisation and fast population growth. If you see the graph of population projections, it is almost like a straight line going up over the next few decades. These sanitation issues are connected to population explosion,” said Gettlemen. According to him, Africa is not doing any better than India when it comes to keeping cities clean. “You go to African urban centres like Nairobi, you see garbage everywhere. I think it is very difficult to make progress without having a conversation on resources,” he added. In the midst of a discourse on overpopulation and resource crunch, are we missing out on exploring whether India’s inherent caste system has got something to do with the challenges that the country faces in keeping itself clean? “While latrines are being built across the country, people are reluctant to use them for several reasons. India, as a society, has assigned a particular group of people for cleaning toilets and faeces. In case they are not available, especially in remote locations, the cost of cleaning toilets amounts of thousands of rupees, which villagers cannot afford. Hundreds of years of caste system and racial hierarchy have confined people to certain jobs. How can you have a common civic sense in a society in which you have already decided that not everybody is equal?” asked Saini. For Das, the problem is not caste or culture. “Don’t think of poor sanitation as a caste or cultural problem. Cultures take thousands of years to change. Governance has to change. In India, when you visit municipal corporations, all you see is clerks and not engineers. Mr Modi has to think of how successfully he can change governance and attitudes. Taking a cue from Das’ emphasis on attitude change, Mahurkar said that it is possible in India and it has happened in Gujarat. “Vankar, the untouchable weaver community in Gujarat, is one of the cleanest communities among poor people in Gujarat,” he affirmed. Talking about his experience of reporting on Swachh Bharat Mission, Gettlemen narrates how he found several toilets being built in haste, but not connected to sewers. “There has been a rush among local officials to show progress because they have this website that shows show many villages have been made open defecation-free. They have to prove themselves before the Centre since it is a high-priority project. So, even though nobody is using these toilets, they have been registered as a progress,” added Gettlemen. Harping on the issue of governance deficit, Das concluded, “We overestimated the power of Mr. Modi when we elected him. He has to make sure that municipalities are equipped with sanitation engineers, with ways to segregate and dispose waste. The conversation about culture is taking away the focus from the issue of implementation."